First impressions count and your first impression to a potential employer is not when you walk into the interviewing room. Instead, it is your LinkedIn summary. Your LinkedIn summary, as well as LinkedIn student summary, is what gives prospective employers an overview of your career history, skills and personality. It is one of the key tools they are going to use to decide whether or not you are a good match for their business. There are many dry and formulaic LinkedIn summaries around. Many seem to follow a LinkedIn summary template that tells them to use buzzwords like ‘responsible’, ‘strategic’ and ‘creative’. Following one of these templates will help you write an adequate and safe summary but it won’t help you to stand out from the crowd. While following a set formula is not going to win you a summary profile of the year award, by researching great examples will help you to see the types of things you need to include and how to do so effectively. Take your chances today and contact us so we can happily help you with writing a compelling summary profile for LinkedIn! Below are two LinkedIn summary samples that will help you to see what a great one looks like. If you are still doubtful about whether or not you can write one yourself, consider speaking to a LinkedIn consultant who will be able to provide you with advice tailored to your industry and work history. When I was seven and watched an Indiana Jones movie for the first time I had found my calling in life; I was going to be an archaeologist and fight evil while discovering sacred antiques. After many years of studying and gaining a PhD in history, I might not be traveling around the world fighting evil or digging up lost historical artifacts, but I am still no less passionate about history. And I do get to be Indiana Jones in his other persona; a history professor. When I’m not doing my own research, which has been published in several leading journals, I’m imparting my knowledge to students with the aim of inspiring them to be as enthusiastic about history as I am. With this discovery behind me, I’ve set up my own marketing company which will do both. I’m using my experience on working with high profile clients, to create innovative marketing initiatives for your company that will help to increase your brand recognition and ultimately improve sales. Marketing is a fast-paced and ever changing industry, and I’ve seen a lot of trends come and go during my career. I’ve successfully helps to negotiate my clients through extremely challenging times, even helping to improve their profits when their competitors have struggled to stay afloat. Now I’m able to offer my knowledge, skills and experience to a wider portfolio of clients. If you’re interested in hearing more about what I can offer you contact me today. 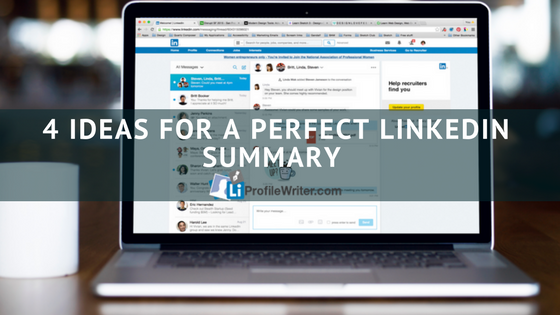 Take a look further to know more about the best summary tactics and strategies for you to write an awesome LinkedIn summary! It is known that what makes a great LinkedIn profile is not only your name and your photo, having a professional looking profile in LinkedIn actually demands some work and thinking in order to achieve great things. The most successful profiles on LinkedIn have been through a lot in order to be the top of the list when it comes to professionalism. However, in order to avoid all this trouble, you can use a LinkedIn CV writing service in order to make your profile look immensely better without having to spend much time or effort. Making your profile look professional is really important, as 7 out of 10 professionals describe LinkedIn as a trustworthy source of professional content, so it is better to comply with this description. Also, it is known that summaries with more than 40 words are more likely to show up on search engines, making them really important resume tactics and strategies. However, you may be wondering what to write in a LinkedIn summary and how it is supposed to look like. For this idea, we recommend using a compelling writing. If you fail to make your profile viewers fall for you at this first impression, there may not be a better opportunity for you later. So, take your time and write a good self-description about your past, your present and your hopeful future in a way that looks appealing in order to look better for potential customers and employers. If you own a business, you have worked for big important companies or you just have made a big impact on your area of expertise nationally or internationally, let everyone know about it in your profile summary. However, always remember to use a good storytelling style in order to make people eventually read what you have to say. Writing your self-description shouldn’t be a problem. However, it is always important to do it with a great storytelling and compelling writing that makes other people fall for your stories. Even though this is a place to infuse professionalism, there’s no a real problem when you write with easy-to-read content and a less preoccupied style. Yes, even though you may be thinking that keywords don’t matter too much, they are actually a great way to make your content appear on search engines like Google. Using a correct amount of keywords and with a perfect description and summary, your profile will eventually achieve more views. Your keywords should all be about your skills and services, also include all those relevant to your field of work. If you want to know more about what you can write on your summary as keywords, we recommend taking a good look at those LinkedIn profiles of expert and professionals on your own area of work in order to see how they make use of keywords depending on the industry. This is also really important when writing a summary profile for LinkedIn. Writing your contact information will make it easier for people to contact you and eventually make you more reachable. These are the most important tips you can read about writing a good LinkedIn summary for job seekers. However, every time you are writing your description you should always take into account the type of people you are targeting your content to, if you want your profile to be seen by a certain kind of people, think ahead and write about what they may be looking for. Do you want your summary profile for LinkedIn to look awesome? Well, using a LinkedIn CV writing service can be your best option. This service will help you achieve far better outcomes from your profile and eventually make it look professional using a style of writing that looks compelling. Also, this LinkedIn profile writing service is in the hands of experts who know the most innovative summary tactics and strategies to make your profile look wonderful. Puzzled over improving your page performance? With right LinkedIn summary samples you will not be lost! Craft your own sample today!